I’m copying over the promotional email I got. Note that the last day to apply for a ticket is October 24, 2014. TEDxUppsalaUniversity will run their second event ever at Uppsala Stadsteater on Saturday, November 15. Eight local and international speakers, ranging from scientists to authors to activists to musicians, will give unique, surprising and personal talks around the theme ‘Who Cares?’. Join us for a day of brilliant talks and workshops that will blow your mind and make you wonder: what do I really care about? TEDx is designed and organised entirely by local volunteers in Uppsala. The independently organised event will be held in the globally recognised TED style. Otto Cars will talk about the dangers of infectious diseases in today’s world. Malin Forsgren, who shelved her career to build the Swedish branch of worldwide organisation Operation Smile, which now provides half a million free health checks and 20 000 cost free operations every year to children with facial deformities, will talk about how “reason leads to conclusion, but emotion leads to action”. Martin Wehlou will show us how he aims to revolutionise the way doctors make their everyday decisions. Jan Chilar will give a short, practical talk “what does ‘clean’ mean?” will challenge our conception of how we should use chemicals in our lives. From bathing rituals of ancient Romans to sophisticated cleaning products of contemporary society, improvements in hygiene have always gone hand in hand with increased public health… but do we need all those cleaning products? What if our grandma was right when she told us to spray vinegar all around the house? If you want tickets to the live event at Uppsala Stadsteater on Saturday, November 15 can apply on the TEDx Uppsala University website www.tedxuppsalauniversity.com from Monday, September 29. The event will also be live streamed on our website during the event for those who want to be a part of TEDx live. Get a few friends together and watch a day of brilliant ideas and personal stories. Edited videos of each talk will be posted the week after the event. Check our websites, Facebook or twitter for this release. My book “Rethinking the Electronic Healthcare Record” is now out. You can get it almost anywhere, but the best description is on the Amazon.com page. Current electronic healthcare record (EHR) systems utterly fail to assist doctors and nurses in their work; designed without recognizing the actual needs of those users, but rather solving mostly administrative problems instead. This failure results in an ongoing lack of safety and efficiency in care delivery. We need to do much better. This book lays out how an effective EHR system should be built to deliver effective support for a doctor throughout the phases of her profession, from how a doctor learns her profession, to how she examines a patient, analyzes clinical findings, reaches conclusions, and finally applies therapy. The result is accurate, economic, safe, and consistent healthcare. This draft is significantly shorter and more focused than earlier drafts. I’ve also incorporated the “combinatorial matching” idea from L.L. Weed, and modified it to be more scalable. With that, I have a knowledge-based support and documentation system, with a complete flow from first patient contact to treatment. It goes way beyond what any current EHR systems do, and would be the help we need as doctors, instead of the drag of the current generation. Any comments are welcome. My email can be found under the section “Draft Versions” in the manuscript. You can also comment on the blog itself, of course. At least during the first two weeks, then they’re closed (due to spam). I just uploaded the next draft (v10) of my book on EHR systems. I included a chapter on business cases, and expanded quite a bit on the document tree structure. You can find a diff file for version 10 there as well, if you want to focus on the changes. …which always points to the most recent draft. Currently I’m on draft 15 and will upload 16 later today. Sorry about that piece of bad information. 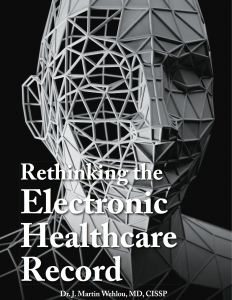 Back in January, I began writing a book on the Electronic Healthcare Record. Not how they work (they don’t), not just what’s wrong with them (most everything), but mainly going back to basics and figuring out what they are really for. Or should be for, more accurately. Current systems are a marvel of bad design and misunderstandings of purpose. I’m trying in the book to figure out why, and what to do to improve on things. The contents range between the medical and the technical, taking side roads into politics, both the office kind and the real kind. The contents are mainly based on the Swedish situation, but I welcome any input on how it is elsewhere. If I can be made to understand the differences, I’ll only be too happy to take that into account in the text. I’m hoping with this book to make the stakeholder ask the right questions, else there is no hope we’ll ever get the right answers. The intention is to have it ready for publication sometime in June 2014. I’ll publish it under our own name through one of the publish on demand sites.